Bad News From the Past / We're Old Murder, Inc. 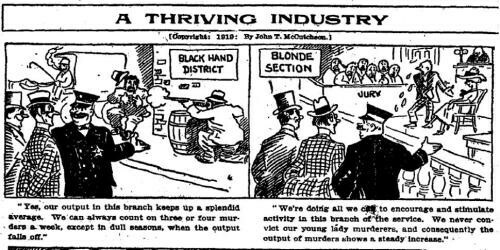 Courtesy of cartoonist John McCutcheon, here's a lighthearted look at homicide as practiced in Progressive-era Chicago. Chicago Tribune, December 17, 1919. Not much interpretive gloss required here I think. Our smiling flatfoot tour guide is fairly representative of the Chicago Police Department's rock-bottom public image at this time. As near as I can tell, there are no factual grounds for McCutcheon's conviction that male juries were prone to acquit only the babes while convicting old ladies. He may have just been exercising a little comedic license.